Adaxes ADSI Provider lets you use ADSI interfaces to connect and communicate with Adaxes Service. You can use the ADSI Provider in custom client applications, standalone scripts, and scripts executed by Business Rules, Scheduled Tasks and Custom Commands. The Adaxes ADSI objects are COM Automation objects that can be accessed and manipulated by any language that supports COM, such as VBScript, PowerShell, C++, and .NET languages like VB.NET and C#. 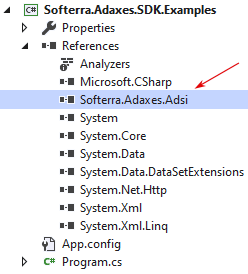 Adaxes ADSI Provider is implemented as a .NET assembly targeted for Microsoft .NET Framework version 4.5.2. The assembly is called Softerra.Adaxes.Adsi.dll and is installed into the GAC when you install Adaxes ADSI Provider. If your PowerShell script is executed by a Business Rule, Scheduled Task, or Custom Command, the assembly is loaded automatically. Ensure that the target framework for the project is .NET Framework 4.5.2. Add a reference to the Softerra.Adaxes.Adsi assembly to the project (the assembly is installed into the GAC). To start using the ADSI Provider, you need to establish a connection with an Adaxes service. You can either establish a connection with the specific Adaxes service running on a specific computer, or, if you have multiple Adaxes services sharing configuration, you can let the provider select the service to connect to. In the latter case, the ADSI provider will connect to the nearest available Adaxes service. To connect to the Adaxes service running on a given computer, you need to create an instance of the AdmNamespace class and call the GetServiceDirectly method of it, passing the DNS name or IP address of the computer as the parameter of the method. The AdmNamespace class supports the IAdmNamespace interface. A connection is represented by the IAdmService interface. All Adaxes services sharing common configuration are grouped into logical units called configuration sets. Adaxes ADSI Provider allows you to connect to the nearest available Adaxes service that belong to a configuration set. To connect to the nearest Adaxes service from a configuration set, you need to create an instance of the AdmNamespace class and call the GetNearestService method of it. The first parameter of the method specifies the name of the AD domain where to search for Adaxes services. The 2nd and 3rd parameters of the method are the username and password that will be used to access the domain. If you want to use the credentials of the currently logged on user, set those parameters to NULL. A connection is represented by the IAdmService interface. If there are multiple configuration sets in your domain, you need to specify which one to use by setting the ID of the desired configuration set to the DefaultConfigurationSet property of the AdmNamespace instance. For information on how to get the ID of a configuration set, see Get the Configuration Set ID. To perform any operation in the directory, you need to bind to a directory object first. For example, to read and write properties of an object, first you need to bind to the object; to create a new object, you need to bind to the OU where you want to create the object; to search the directory, you need to bind to the directory object, under which you want to perform a search. 'Directory object' here means both Active Directory objects and Adaxes configuration objects, like Business Rules, Security Roles, Scheduled Tasks, and Business Units. After you've bound to an object, you can use the appropriate ADSI interfaces to perform operations on the object. The interfaces you can use depend on the type of the directory object. All object types support the IADs and IAdmTop interfaces. User objects support the IADsUser interface, group objects support the IADsGroup interface. Container objects, such as Organizational Units, support the IADsContainer interface that allows you to enumerate and manage their child objects. For more information, see Interfaces Supported by Directory Objects. To bind to a directory object, you need to call the OpenObject method of the IAdmService interface. To specify to which object you want to bind, you need to provide the ADS path of the object as the first parameter of the method. Adaxes (required): Specifies the namespace name of the ADSI provider. The namespace name for the Adaxes ADSI Provider is Adaxes. The namespace name of the provider is case sensitive. Server (optional): Specifies the domain controller name, IP address, or the domain name where the provider will search for the directory object referred by the ADS path. Port (optional): Specifies the port to be used for the connection. If no port number is specified, the ADSI provider will use the default port number. The default port number is 389 if not using an SSL connection or 636 if using an SSL connection. ObjectIdentifier (required): Specifies the identifier of a directory object. The identifier can be a distinguished name (DN), GUID or SID (see examples below). To work with ADS paths, you can use the AdsPath and DN helper classes. For details on how to get the DN of a directory object, see Get the DN of an Active Directory Object. The following example shows how to bind to a specific user account by DN and then disable the account. Each directory object has a globally unique identifier (GUID) that is stored in the objectGUID property of the object. As opposed to the distinguished name that changes when an object is renamed or moved, the object GUID never changes. So, if you want an ADS path to be valid after an object is renamed or moved, you need to use the object's GUID in the path. If your Adaxes service manages multiple AD domains, it is recommended that the ADS path contains the name of the domain where the object is located. This will make the binding operation faster. The following example binds to a specific directory object by its DN, gets the GUID of the object, and then binds to the object using the GUID. Each Active Directory security principal (user, security group, computer) has a security identifier (SID) that is stored in the objectSID property of the object. The SID is unique within the domain and does not change even if the object is renamed or moved to another container (within the same domain). To convert the value of the objectSID property to the SDDL form, you can use the Sid class. The following example binds to a specific user by its DN, gets the SID of the user, and then binds to the user using the SID. In this case, the path will refer to the RootDSE of the directory server that is used to store Adaxes configuration data (ADAM or AD/LDS). The following example shows how to bind to the RootDSE of a domain, and get the DNS name of the domain controller being used by the Adaxes service. The domain partition (or the default naming context) stores directory objects like users, groups, computers and Organizational Units. The domain partition is replicated to all domain controllers of a domain. When you bind to the domain partition, you bind to the top container of the domain. This means that if, for example, you want to search the whole domain, you need to perform a search under the domain partition object. The <servername> is the name of a domain or the DNS name of a domain controller. The following example shows how to update the minimum password length in the Defult Domain Password Policy by updating the minPwdLength property of the domain partition object. In ADSI, every directory object is represented by an object that exposes the IADs interface. To get the ADS path of the parent container of an object, you can use the IADs::Parent property. Then you can use the obtained ADS path to bind to the parent object. The following example shows how to bind to the parent container of a directory object. In ADSI, every container object exposes the IADsContainer interface. You can use the IADsContainer::GetObject method to bind to a child object. The IADsContainer::GetObject method takes the object class and the relative distinguished name (RDN) of the directory object you want to bind to as parameters. The following example shows how to bind to a child object of a container object. You can also use the AdsPath helper class to build the ADS path of a child object. This approach works only if the ADS path of the parent object contains the object DN. Using Adaxes ADSI Provider, you can also manage Adaxes configuration objects, such as Security Roles, Business Rules, Scheduled Tasks, and Business Units. Adaxes-specific objects are stored in the Adaxes Configuration Server (ADAM or AD/LDS) that is installed on the computer where the Adaxes Service is running. You can manage Adaxes configuration objects in the same way you manage Active Directory objects. Each type of an Adaxes configuration object is stored in a separate container. That is, there is a separate container for Business Rules, Security Roles, Property Patterns, etc. To get the ADS path of a container that stores Adaxes configuration objects, you need to call the GetConfigurationContainerPath method of the IAdmServiceBackend interface and provide the alias of the desired container as the first parameter of the method. The IAdmServiceBackend interface can be obtained via the Backend property of the AdmNamespace instance. The following example shows how to get the ADS path of the container where Business Rules are stored. Example 2: Bind to the Scheduled Task called My Task. For information on how to manage Adaxes configuration objects, see the section entitled Managing Adaxes Configuration. Directory object data is stored in its properties. For example, the first name of a user is stored in the givenName property of the user object. Some object properties are required while others are optional. To read properties of a directory object, you can use the IADs interface that is supported by all ADSI objects. To read a property, you need to call the Get or GetEx method of the IADs interface and pass the LDAP name of the property you want to read as the parameter of the method. The following example shows how to get the user logon name (pre-Windows 2000) of a user account. The user logon name is stored in the sAMAccountName property. Apart from the IADs interface, you can also use other ADSI interfaces to read properties of directory objects. The interfaces you can use depend on the type of the directory object. For more information, see Interfaces Supported by Directory Objects. The following example shows how to get the Terminal Services profile path of a user by reading the TerminalServicesProfilePath property of the IADsTSUserEx interface. To modify properties of a directory object you can use the Put and PutEx methods of the IADs interface. Both methods only make changes to property values contained in the property cache of the object. In order to commit changes to the directory, you must call IADs::SetInfo. The following example shows how to modify the description and account expiration date of a user object. See also: Modifying User Accounts, Enabling and Disabling User Accounts, Unlocking User Accounts, Renaming User Accounts, Modifying Groups, Modifying Organizational Units. To create a new directory object, first you need to bind to the Organizational Unit or container where you want to create the object. All containers and Organizational Units expose the IADsContainer interface. To create a new object, you need to call the IADsContainer::Create method and pass in the object class and relative distinguished name (RDN) of the object being created. The Create method returns an instance of an ADSI object that represents the new directory object. Then you need to set object properties by calling IADs::Put and IADs::PutEx methods of the returned ADSI object. To save the object to the directory, call IADs::SetInfo. The following example shows how to create a new user in Active Directory. See also: Creating Groups, Creating Computer Accounts, Creating Organizational Units. To delete a directory object, you need to bind to the object and call the DeleteObject method of the IADsDeleteOps interface. The IADsDeleteOps interface is supported by all directory objects. To copy a directory object, first you need to bind to the target Organizational Unit or container where you want the copied object to be placed. All containers and Organizational Units support the IADsContainer interface. To copy a directory object, you need to call the CopyHere method of the IADsContainer interface. The first parameter of the method is the ADS path of the object to be copied. The second parameter is the relative distinguished name (RDN) of the new directory object. The following example shows how to create a new user by copying an existing user account. # Create a new user object by copying the user account of John Smith. // Create a new user object by copying the user account of John Smith. To move a directory object from one location in the directory tree to another, first you need to bind to the container or Organizational Unit where you want to move the object. All containers and Organizational Units support the IADsContainer interface. To move a directory object, you need to call the MoveHere method of the IADsContainer interface. The first parameter of the method is the ADS path of the object to be moved. The following example shows how to move a user from one Organizational Unit to another. To obtain a list of directory objects located in a container (or Organizational Unit), first you need to bind to the container. All containers and Organizational Units support the IEnumVARIANT interface that can be used to enumerate child objects. If you want to enumerate only child objects of specific types, you can use the IADsContainer::Filter property. The following example shows how to enumerate all users and groups in an Organizational Unit. See also: Enumerating Computer Accounts, Enumerating Child Objects. Using Adaxes ADSI Provider, you can search for Active Directory objects and Adaxes-specific objects, such as Security Roles, Business Rules, and Scheduled Tasks. To perform a query in the directory, first you need to bind to the directory object under which you want to search. All directory objects support the IAdmDirectorySearcher interface. Using the IAdmDirectorySearcher::SearchFilter property, you can provide the LDAP search filter that defines the search criteria. The IAdmDirectorySearcher::SearchScope property specifies the scope of the search. To start searching, you need to call the IAdmDirectorySearcher::ExecuteSearch method that returns the IAdmSearchResultIterator interface. To fetch all search results, call IAdmSearchResultIterator::FetchAll. Each search result is represented by the IAdmSearchResult interface. The following example shows how to search for all users from the Sales department in the Organizational Unit called People. See also: Searching User Accounts, Searching Groups, Searching Computers, Searching Organizational Units. To add or remove members from a group, first you need to bind to the group. Each group object supports the IADsGroup interface. To add an object to a group, call the IADsGroup::Add method; to remove an object from a group, call IADsGroup::Remove. Both methods take the ADS path of the directory object to be added or removed from the group. The following example adds John Smith and removes Ann Wilson from a group. See also: Getting Group Members, Finding Groups in Which a User is a Member. When performing operations on directory objects, Adaxes may execute additional actions. For example, you may have a Business Rule that automatically creates an Exchange mailbox and home folder for newly created users. The information about additional actions is recorded in the Execution Log of an operation. To get the Execution Log of the last operation performed on a directory object, you can use the IAdmLastOperationOps interface. The IAdmLastOperationOps interface is supported by all directory objects. The GetLastOperationInfo method of the interface returns the IAdmOperationInfo interface. To get the operation Execution Log, you can use the IAdmOperationInfo::ExecutionLog property. The Execution Log is represented by the IAdmExecutionLogEntryCollection interface. Execution Log records are represented by the IAdmExecutionLogEntry interface. The following example outputs the Execution Log of a user creation operation.